Your chance to vote for the Classic FM Best Classical Music Education Initiative in Rhinegold Publishing's annual Music Teacher Awards For Excellence. This award will honour an education initiative which has used classical music in an innovative way, shown musical excellence and had a positive impact on a significant number of participants. The five nominees for the Best Classical Music Education Initiative were chosen by a selection panel comprising the editorial team of Music Teacher magazine, chaired by Alex Stevens, editor of Music Teacher. The panel judged potential nominees against the criteria of musical excellence, impact and innovation. Any classical music education initiative based in the UK was eligible for this award, but the panel felt strongly that the chosen five initiatives scored highest against the agreed criteria. The awards will be announced at the Music Teacher Awards on the evening of February 22nd at the Sheraton Grand London Park Lane. Supported by Music Teacher Magazine, the awards were launched five years ago to celebrate excellence in the UK’s music education sector. The awards take place during the inaugural Music & Drama Education Expo, one of the first events of its kind to take place in the UK. It takes place on February 22nd – 23rd at London Olympia, is free to attend, and was established by Rhinegold Media & Events. To find out more information about the event and how to attend, visit the website. Vote for the nominees below before voting closes on Friday 2nd February at midday. Only one vote per e-mail address allowed. NYO Inspire Orchestra is NYO’s exuberant teenage symphony orchestra on a unique mission to engage teen audiences and give them the very best orchestral experience: a live orchestra of their peers. Like all NYO initiatives, the musicians volunteer time to share their talents with others. Inspire Orchestra toured schools and youth clubs in Birmingham, Walsall and Wolverhampton, reaching 1,300 teenage and youth audiences. For the most part, these audiences were experiencing live orchestral music for the first time. This game-changing inclusion and access programme gives opportunities to musicians from state education and backgrounds that are unrepresented in professional orchestras in the UK; 98% of the orchestra’s participants were from state schools while 20% were from Black, Asian and Minority Ethnic background. Challenging the widely-held perceptions of opera is the basis for the successful partnership between Welsh National Opera and CânSing. Following a successful initial pilot, several collaborative works now appear as part of the suite of resources available on the CânSing bilingual songbank including English, Welsh and original language versions of the 'Toreador Song' and 'Evening Prayer' which have been downloaded more than 12,000 times. Subsequently, the partnership has developed a new, innovative style of resource which continues to push the boundaries of opera and it’s suitability for a young audience; making it accessible to all whilst retaining authenticity. The pioneering “Humming Chorus” resource introduces musical language into the teaching materials, and in particular, the interactive screen provides a very visual and flexible representation of the arrangement; introducing elements of a traditional score including; time/key signatures, notation (pitch and duration) to learners. The resources are available to download completely free of charge for all, have already reached thousands of learners and have been used successfully at large events with children as young as 5. 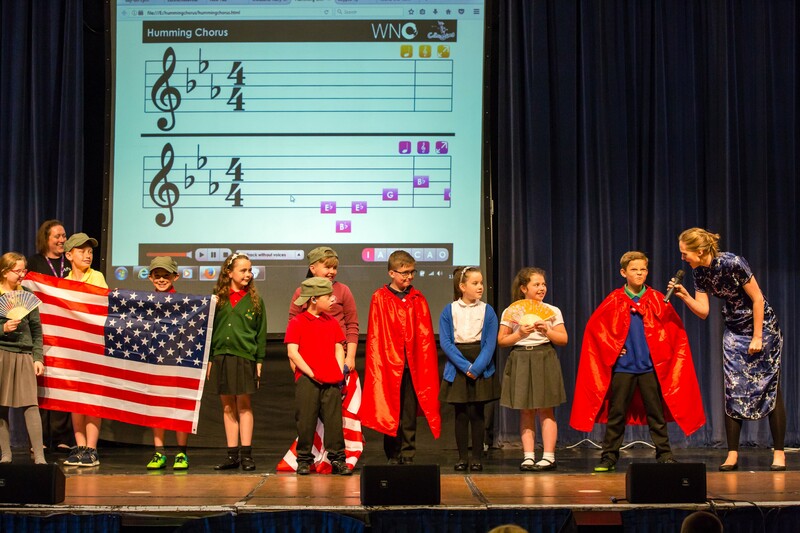 This commission from United Learning and the resulting large-scale music project with choral composer Alexander L’Estrange has brought together over 30 schools from across the country. The brand new choral extravaganza Wassail! is a sequence of 12 uplifting folk-inspired Christmas songs exploring the sacred and secular aspects of the festive season. The project provides young people and their teachers with a joyful and rewarding musical experience that also offers the opportunity for them to build lasting connections with the wider community. Over 1,200 young people took part in two national premieres in November 2017, with the first US performance shortly after. The involvement of Voces Cantabiles Music with this project enables teachers and students to engage with VOCES8 scholars through workshops, and to perform in the premieres alongside acclaimed vocal ensemble Apollo5. The project offers face-to-face CPD and online training and is already acting as a stimulus for further collaborative community work - and should do for years to come. Between February-May 2017, 250 young musicians and singers from Bristol and the South West came together for a once-in-450-year project. 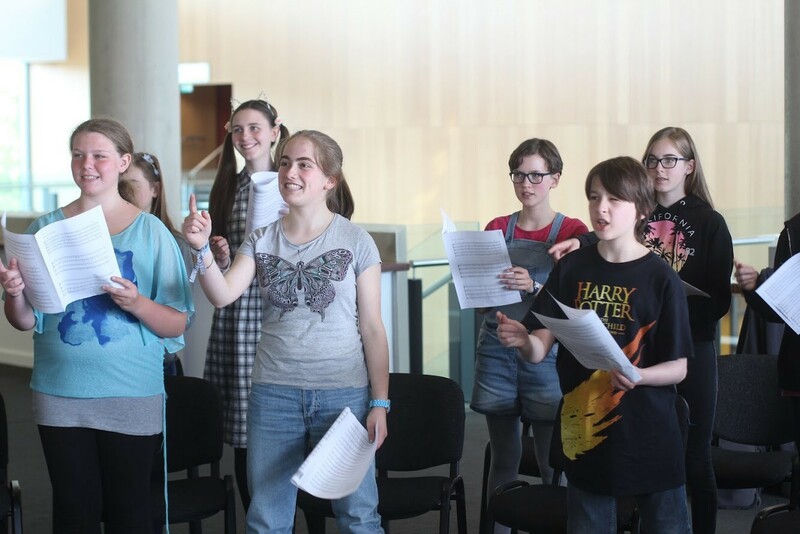 In a collaboration between some of the world’s leading early music specialists from Monteverdi Choir and Orchestras and Brisol Plays Music, young singers and musicians from across the South West gathered at Colston Hall for three days of inspiring workshops and to experience the dress rehearsals of ‘Il Coronazione di Poppea’ and ‘Orfeo’. The workshops gave young musicians an opportunity to play and learn about early music with Monteverdi Orchestra musicians on instruments such as the viola da gamba, chittarone, cornetti, and lutes. Young singers worked with MCO singers on choral passages from the opera, focusing on emotionally authentic and linguistically accurate performance technique. Students were then welcomed by Sir John Eliot Gardiner before seeing the complete dress-rehearsals, which began with the passages the young singers had learned. 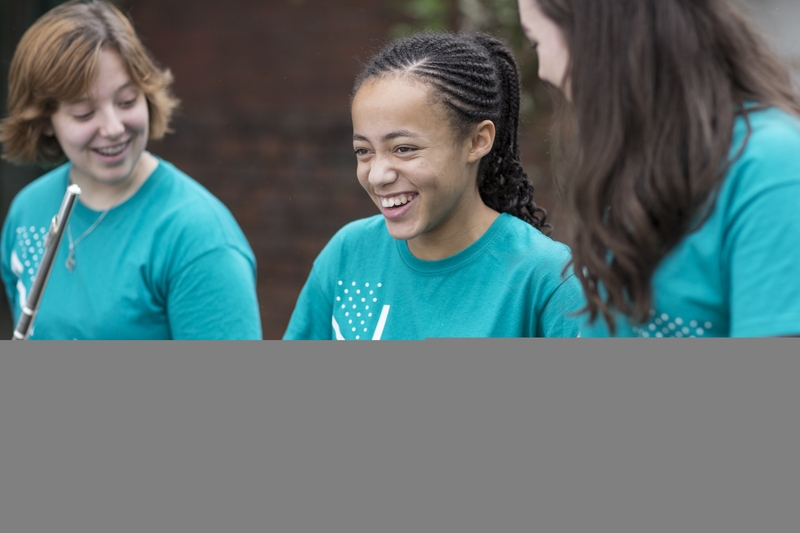 NYWO brings together young woodwind, brass and percussion players from all across the UK to develop as musicians and as people in the musically-immersive and safe environment that is created on a NYWO residential course. NYWO is an inspiring charity which gives young musicians the opportunity to work with some very exciting people in terms of conductors, composers, tutors and soloists. 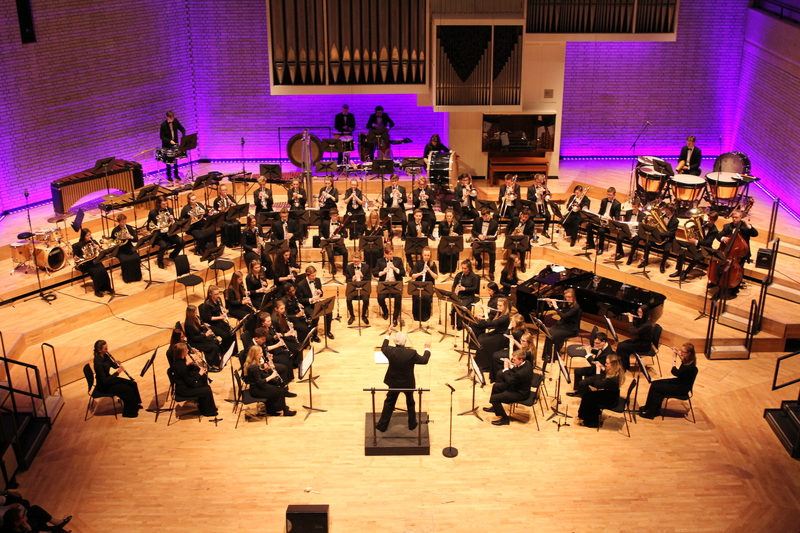 Through its work with its partner organisations including the John Lewis Partnership, the RNCM, and the Royal Air Force Music Services the opportunities are ever-increasing. Whether it’s playing at the BBC Proms, touring abroad or working with small communities, NYWO is an orchestra which is Youth in name, but professional in standard! In a sentence, NYWO is a ‘family’ made up of wonderful young people, lasting friendships, inspiring music, musicians and dedicated staff. NYWO’s Patron Sir Simon Rattle, has said that “…the future of music lies in the hands of young players such as these….” and we agree. For people who value music, friendship and opportunity, this is an organisation worth exploring!